It’s official. Chris Christie is running for president. The only reason for Christie’s run appears to be either his outsized ego or deep delusion about his chances of winning. Christie’s “bully” image was actually carefully cultivated by his own office. Staff members armed with camcorders followed him to town hall meetings, to capture Christie dressing down and belittling citizens who had the temerity to criticize him. Christie’s staff edited the videos, and posted them to his YouTube channel, where conservatives swooned over them. Now, Christie is at best a vanity candidate who’s being outpolled by Donald Trump, and might not even make the cut for the first Republican candidate’s debate. What happened? Mostly, Chris Christie happened. HIs got no one to blame bur himself. The “Christie Bubble” is so impenetrable that he may actually think he can win. Critics in his own party have accused Christie of living in a “bubble.” Surrounded by a tight-knit circle of advisers who effectively shield him from reality, Christie remains convinced that his famous bluster and bravado are all he really needs to win, despite a ton of bad press. Christie’s years in office have left such a deeply negative impression, that most New Jersey voters wouldn’t vote for him for president. With just about every poll concerning his candidacy, Christie reaches a new low in approval ratings. A January Quinnipiac poll found that nearly 3 in 5 New Jersey voters — 57 percent — did not think Christie would make a good president. In a February 2015 Rutgers-Eagleton poll, only 37 percent of New Jersey voters gave Christie a favorable rating, a drop of seven points in two months; 53 percent felt unfavorable toward Christie. After his performance at the Conservative Political Action Conference at the end of February, Christie finished tenth in the CPAC straw poll, with just 2.8 percent of the vote. In March, the Farleigh Dickinson University found that just 35 percent of New Jersey voters approved of Christie’s job performance. An April Rutgers-Eagleton poll found that 69 percent of New Jersey voters think Christie would not make a good president; a tend point increase from the February poll. A majority, 58 percent, said that “presidential” does not describe Christie “at all.” Nearly the same percentage, 57 percent, expected him to run anyway. These days, Christie trails even Donald Trump in the polls, even though most people don’t consider Trump a serious candidate. Even Voldemort, the villain of the Harry Potter books, polls better. Yet, Christie has managed to convince himself that the reason New Jersey voters have nothing nice to say about him is because they want him to stay on as governor. Christie wants to cut Social Security and raise the retirement age. In April, Christie tried to talk his way back into the race for the GOP nomination by going after Social Security with a plan to cut benefits and raise the retirement age. Christie tried to rebrand himself as a “truth-teller,” giving the country a dose of “straight talk” about “entitlement” programs. Social Security advocates labeled Christie’s plan as the first part of a “bait and switch.” Christie’s “means testing” would end up costing billionaires a mere pittance — $2,663 per month in 2014. While Christie would start his “means testing” at $80,000 per year, conservatives have proposed it for those earning as little as $20,000 per year. Christie emphasizes “means testing” over his plan to also raise the retirement age to 69. That’s because raising the retirement age is really an across-the-board benefits cut, because it means everyone will receive two fewer years of Social Security benefits. Christie’s plan also ties Social Security cost-of-living increases to the Chained CPI, which records a lower rate of inflation. That mean’s a benefit cut for everyone. Christie wants to do for America’s economy what he did for New Jersey’s. If Christie wants to do for the country what he did for New Jersey, it’s going to be a hard sell. Under Christie, New Jersey ranked 40th in job creation, with a job growth rate of 4.15 percent, compared to a national average of 8.21 percent. Christie may claim to have balance the state’s budget, but he did it through financial maneuvering: reducing payments to state pension plans, shifting money out of dedicated trust funds, delaying property tax rebates, and borrowing to cover an $800 million budget shortfall. Even after the federal government offered $4.5 billion towards its cost, Christie nixed the planned rail tunnel under the Hudson River to New York City, which promised to improve New Jersey’s quality of life, raise property taxes, and spur development. Christie vetoed $7.5 million in funding for family planning clinics, including Planned Parenthood. Christie said the state couldn’t afford it, even though it was a long-standing budget item. Six more vetoes caused six clinic closures, and reductions in HIV tests, breast exams, and other clinical services available to women. Christie vetoed a package of “Buy American” bills that would have strengthened laws calling for public contacts “where possible” with American-made goods, even as New Jersey’s job creation lagged far behind the national average, and suffered the loss of 180,000 manufacturing jobs. Christie’s policies have let to a mass migration from the state. According to United Van Lines’ analysis of national migration data, in six years they booked 4,003 outbound moves from Jersey but posted only 2,169 incoming. In 2014, New Jersey topped the nation for outward migration, for the fourth time in five years. As a result, New Jersey hasn’t come close to economic recovery. According to census data, it’s one of just three states where the poverty rate has increased (from 9.4 percent in 2009 to 11.4 percent in 2013). For the US economy, Christie offers a plan that he says will aid the middle class, but his plan is more of the same conservative tax-cutting to benefit the wealthy. Christies plan drops the current top income tax rate to 28 percent from 39 percent, and drops the current corporate rate from 35 percent to 25 percent. Meanwhile, he cuts back tax credits for the working poor, and reduces subsidies that help working- and middle-class families cope with high property taxes. Christie loves the lush life, as long as someone else is buying. Who doesn’t like to live large on someone else’s tab? Who wouldn’t do so, if they could get away with it? It’s hard for a public figure like Christie — especially one who is downright callous about the economic pain his policies will inflict — to get away with it. That hasn’t stopped him, though. Christie exhibits a taste for the finer things in life, when someone else is paying the bill. On a 2012 trade mission to Israel, Christie and his entourage (his wife, three of his four children, his mother-in-law, his father and stepmother, four staff members, his former law partner and a state trooper) travelled in billionaire casino owner Sheldon Adelson’s private jet, and enjoyed a $30,000 weekend stay in a luxury hotel paid for by King Abdullah of Jordan. A New Jersey Watchdog analysis found that in five years Christie spent $300,000 of his $360,000 state allowance on food, alcohol, and desserts. Of that sum, $82,594 spent on concessions at NFL games during the 2010 and 2011 seasons, was reimbursed by the New Jersey Republican State Committee, in order to avoid a potentially embarrassing scandal. Another $76,373 was spent over the course of 53 shopping trips to Wegmans Food Market. Christie’s trip to a Dallas Cowboy’s game in January raised ethical questions, because Cowboy’s owner Jerry Jones paid Christie’s ticket and travel expenses. Under New Jersey’s ethics rules, government officials can’t accept any gifts related to their “official duties.” Christie and New Jersey had just done business with the NFL, giving the league an $8 million tax break in conjunction with the Super Bowl. Scandal and corruption follow Christie wherever he goes. Loangate: During his time as prosecutor, Christie lent $46,000 to Michele Brown, a top aide in the prosecutor’s office. Christie denied Brown had done anything to help his campaign, but she had pushed for a series of high profile arrests to be made before Christie left his job as U.S. attorney, so that Christie could receive full credit as he ran for governor. Brown went on to serve as CEO of the Economic Development Authority in Christie’s administration. 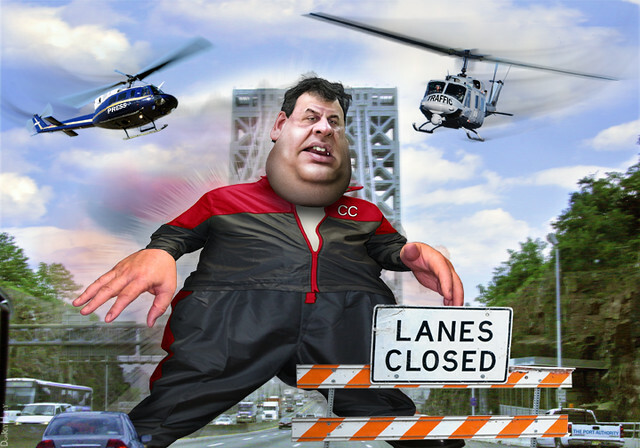 Tunnelgate: Christie allegedly used inflated cost estimates to justify closing canceling the ARC tunnel. Christie claimed that costs for the tunnel had grown to as much as $14 million, when in fact the cost estimates remained unchanged for two years before Christie cancelled it. Sandygate: After Hurricane Sandy, Christie awarded a $150 million no-bid contract to AshBritt, a Florida-based firm. Days later, AshBritt donated $50,000 to the Republican Governors Association, of which Christie was vice chairman. Town Hall-gate: Those town hall meetings that made Christie the darling of the conservative YouTube set were taxpayer supported productions. Taxpayers footed the $12,000 bill for flags, lighting, and equipment. Sheriff-gate: A county sheriff who hired deputies without background checks, and manufactured fake police badges for a “prominent donor” to Christie got off scot-free. He assured an aide that Christie would “have this whole thing thrown out,” and that is exactly what happened. 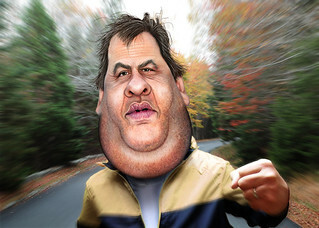 Drive-gate: In 2002, Christie injured a motorcyclist while trying to turn the wrong way on a one way street. He never got a ticket, despite a driving record that included at least six accidents and 13 moving violations. John Stewart put it best: Christie’s comfort with corruption is matched only by that of, say, Tony Soprano.